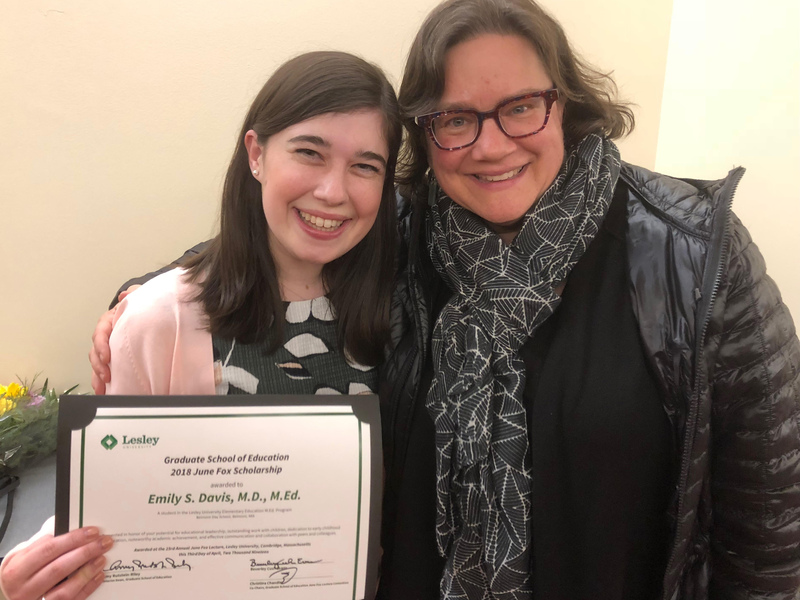 Congratulations to associate teacher, Emily Davis, who was recently honored as the recipient of Lesley University’s Graduate School of Education June Fox Scholarship Award for 2019. Given once a year to one member of Lesley’s Collaborative Residency Program, the award recognizes outstanding work with children, interest in building equity in the classroom, and the recipient’s potential for educational leadership. The award was presented at this year’s annual June Fox Lecture held on Wednesday, April 3. The award and lecture series were created in recognition of the leadership of June Fox, former dean of the Graduate School of Education and professor emerita. Ms. Davis graduated from Brown University in 2013 with a major in education studies, and earned her M.D. in 2018 from the Warren Alpert Medical School of Brown University, with a concentration in medical education. She received her M.Ed. from the Harvard Graduate School of Education in 2017, where she focused on the development of a literacy-based health education program. At Belmont Day, she is currently teaching in fourth grade and taught in the second grade during the first half of the school year. "Belmont Day School is thrilled that Emily has been chosen to receive the prestigious June Fox Award this year. It’s an incredible honor,” said Heather Woodcock, director of Belmont Day’s associate teacher program. “Her relentless commitment to meeting the needs of all children in the classroom combined with her high expectations and empathy for others make her an outstanding educator. Emily is a lifelong learner whose dedication to the craft of teaching will have a tremendous impact on her future students and colleagues."